Yesterday seemed like a disaster; a great 6-time champ lost and we saw the dreaded black wager. Surely we can do better tonight, right? In case you missed it, I put together a comparison of Alex’s strategies against those of Arthur Chu. Doesn’t look like it! Things got off to a poor start when Michael withheld $200 from his attempt at locking Rachel out on the last Daily Double. He’s still got the lead, and an extra dollar, which might give me a headache. Because of Michael’s annoying dollar, I’m going to take a slightly different approach to these calculations tonight. If Rachel doubles her score, she’ll have 15,600. 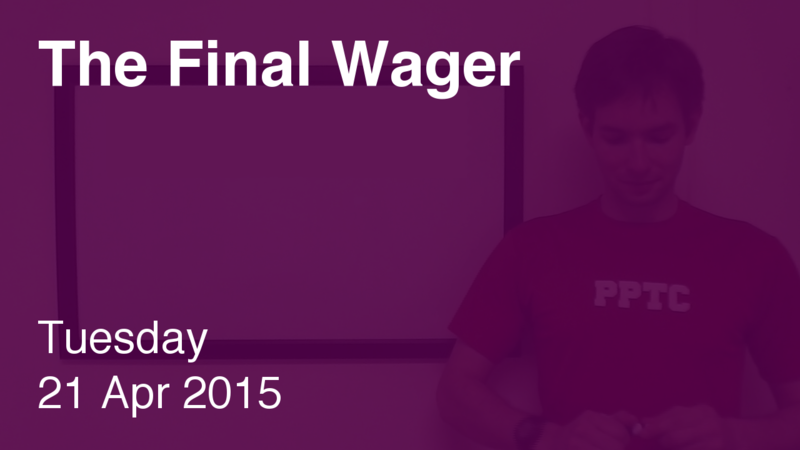 To cover this all-in wager, Michael will need to wager 3,400. NOTE: this already includes the extra dollar, so I’ll mark that with a plus sign. An incorrect response with that wager will leave Michael with 8,801. To get above his total, Rachel must wager at least 1,002, and Todd, 3,002. That’s all-in for both. Michael has some latitude here; I’d cap my downside at 4,400, already taking that dollar into account, so as not to fall below Rachel’s pre-Final total. Man oh man – another day, another black mark. Notice that if Michael misses, he’ll have $8,801 – flipping Todd’s back-door maneuver on its head! I think we had black wagers on consecutive days last season, too, even though on the whole they’re exceedingly rare. Funny story: I gave a group presentation this evening on behalf of Prospect Park Track Club (hence the shirt). I found that instead of picturing everyone in their underwear, I now pretend I’m talking to a camera in my bedroom. What is the Baltic Sea?